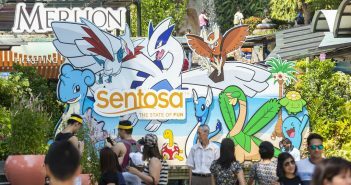 If you haven’t already identified Samsung as more than a phone manufacturer, perhaps it is time you do. 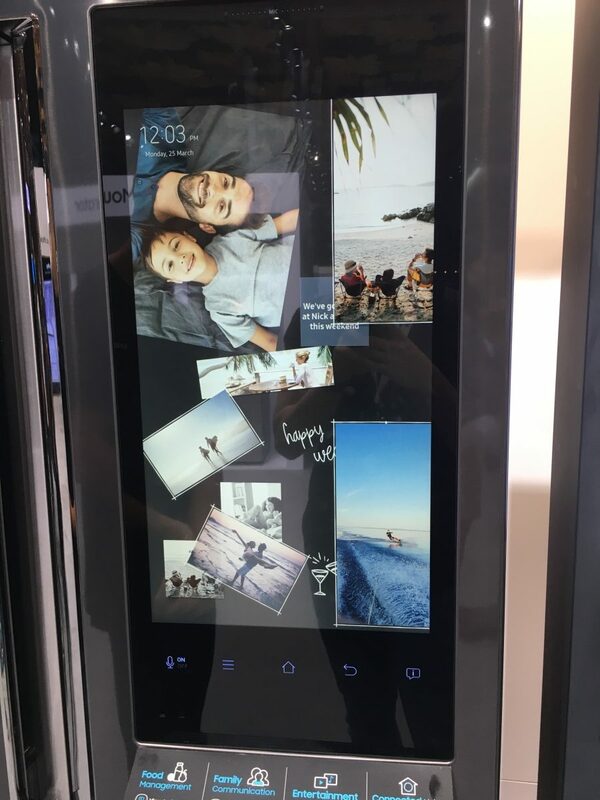 It has hit us that the future is now here, with the promise of technology making our lives easier and more convenient being delivered by Samsung. The company’s commitment to making lives easier and simpler for consumers was brought to life in its new line-up of connected solutions this year. WWW7008M sounds like some futuristic robot, but it is in fact the next-generation washer by Samsung featuring the QuickDrive™ technology and the highly acclaimed AddWash™ door. This year’s new and improved WWW7008M washer has been enhanced with faster wash time (a full load in just 39 Minutes) and even smarter capabilities. Samsung’s QuickDrive™ technology dramatically reduces the washing time required by 50% and energy usage by 20% — but all, without compromising any of its cleaning performance and reliability. The washer also hosts Q-drum™ – it is a large main drum with a plate in the back that rotates independently. Unlike most conventional washers in the market that washes by a constant up and down motion, the Q-Drum™ moves the clothes from top to bottom in the drum and the plate introduces a new back and forth movement. This creates a revolutionary dynamic action powered washing process by two different forces that deep cleans and thoroughly removes dirt and delivering an intense, complete yet quick wash cycle. The washer has also been extensively tested for its durability and functionality – making the mark for the “heat” test which tests its component’s abilities to withstand extreme temperatures and a “slam” test, which involved slamming the door 20,000 times to ensure it can withstand the of daily usage over the years. Laundry Planner: This enables consumers to manage the laundry start and end time – allowing full control of their personal schedules. Laundry Recipe: Eliminates the guesswork of washing altogether – based on information provided by the user, such as colour, fabric type and degree of soiling, the AI automatically gives the recommendations on how to best wash your laundry. Home Care Wizard: Monitors the washer by remote, proactively alerting users about potential problems and providing quick troubleshooting support. What is most exciting and helpful would be the addition of the AddWash™ door – a magical door that allows you to insert any extra pieces of laundry you might forgotten at any given time of the washing process, this door even allows users to add detergent or fabric softener at a later time. Now you don’t have to waste time going through a whole cycle of the wash just for that few pieces of forgotten laundry. 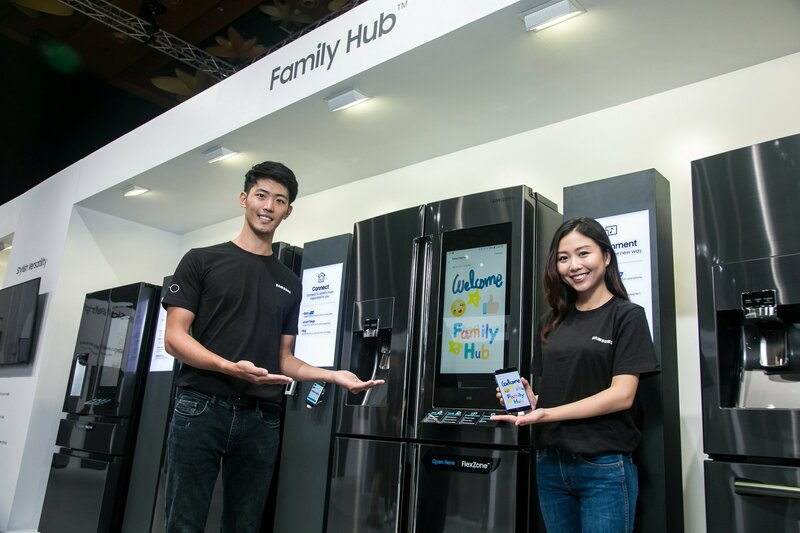 The new benchmark for connectivity is probably the Samsung Family Hub Refrigerator. A feature that sets the 2019 Family Hub apart from previous iterations is support for the new Bixby (Samsung’s personal voice assistance) that allows for a smarter, hands-free, more personalised way to use the Family Hub. You are now connectable to your Samsung devices through remote controlling. You can ask Bixby things such as daily reminders, the weather and top news while getting breakfast ready for the kids. All of these appear on the Family Hub screen so you can see it as well being able to hear it. Through Bixby’s voice ID technology, each family member’s voice is distinguished, so everyone can get tailored information for their individual needs. 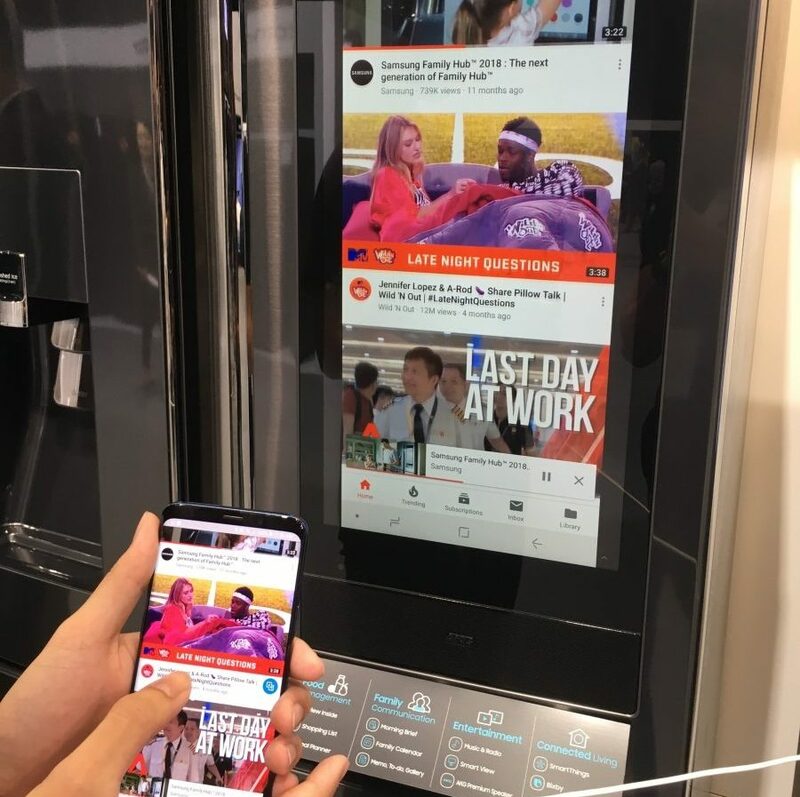 You can even watch YouTube while eating breakfast, listen to your favourite tunes on Spotify with its built-in premium AKG speakers while cooking or even search for a plane ticket through Expedia on the Family Hub Refrigerator! Watch the latest YouTube videos while you eat breakfast. One of the most exciting new features is the Family Board. Families around the world use their refrigerator doors as bulletin-boards to share various things with each other – whether it’s by posting each family member’s schedule and the weekly menu, attaching travel magnets of the countries that they have visited, or proudly displaying the kids’ artworks for everyone to see. Now you can do all of that without having a messy fridge door because of the Family Board. 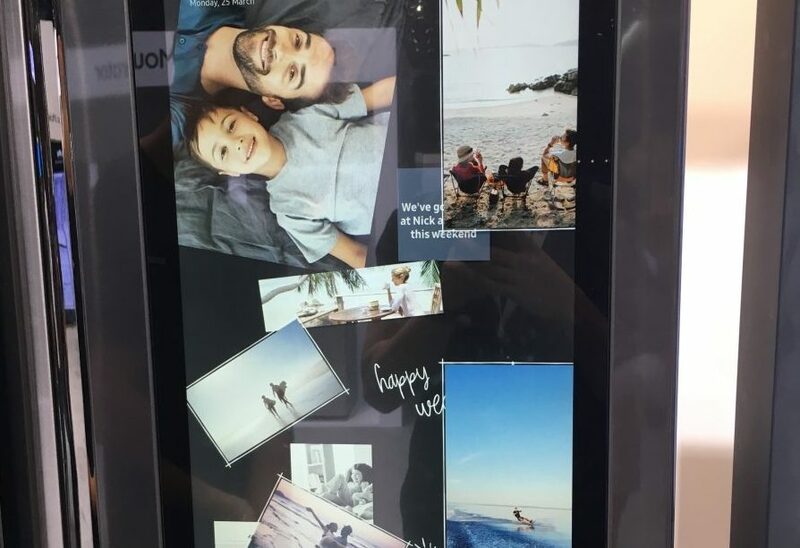 Families can now have a devoted screen to share photos, messages and memories on their fridge, and are able to customise their photos with different photo styles, add handwritten notes and even stickers. The fridge acts as a family board. 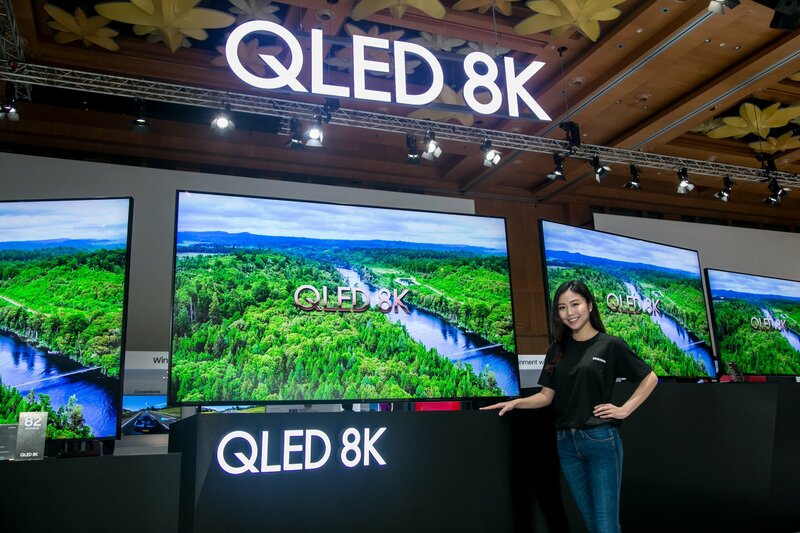 The Samsung QLED 8K Q900R TV, complete with 8K AI Upscaling, is available in four different large screens ranging from 65, 75, 82 and 89 inches. 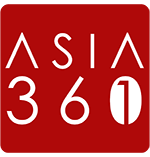 It will feature Real 8K Resolution, Quantum HDR 8K and 8K Quantum Processor – all working together seamlessly to bring to you life-like 8K image quality. To achieve those life-like 8K quality images, the QLED 8K TV features 8K Resolution capable of up to 4,000 nit peak brightness – a standard met by most film studios, which means studio quality films are now available in your homes. How does 8K AI Upscaling works? 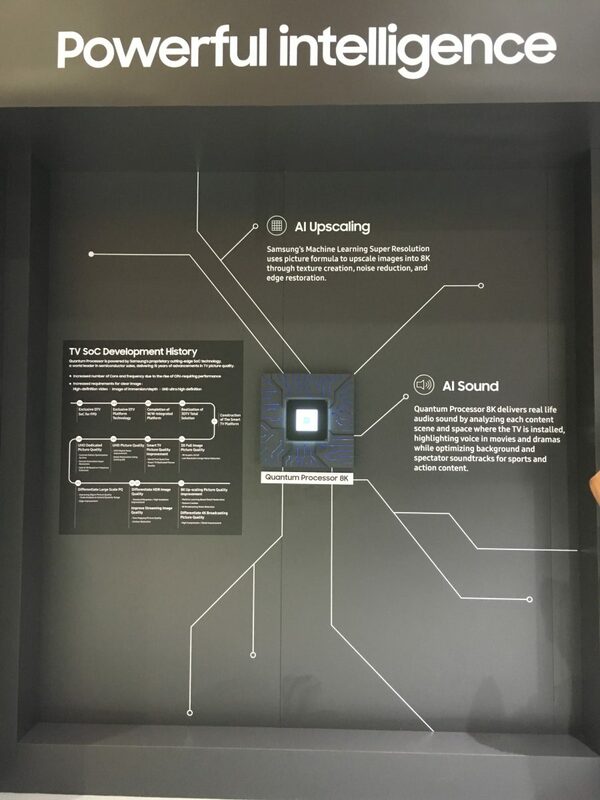 8K AI Upscaling technology is based on artificial intelligence, the AI technology converts whatever content that is played on the TV into breathtaking 8K resolution via AI Machine Learning. It is also adaptive, with its brightness and sounds being made compatible with 8K technology regardless of the original source of quality and/or format. It doesn’t matter if you watching from a streaming service like Netflix, a set-top box, HDMI, USB or mobile mirroring — the 8K Quantum processor will work its magic, upscaling all the content to appear and sound in 8K quality. This means that we don’t need to have 8K produced content to enjoy 8K quality. The Quantum Processor 8K makes it possible. You can also control the QLED 8K using your voice with the help of Bixby, allowing you to ask Bixby any questions and not only that, the QLED 8K also allows you to seamlessly control all your smart home devices and appliances. Also, the QLED’s universal search platform features a simple on-screen guide is an easy way to find streaming content and live TV shows quickly, allowing you to spend more time watching the shows you want. To top it off, Samsung even made the TV friendly for gamers: Dynamic Black Equalizer giving you better visibility in the dark and uses detailed scene analysis to optimize image quality so you can watch your enemies every move – even in the darkest of scenes. QLED 8K also uses FreeSync(VRR) technology, giving you the real-time lower-lag gaming speed you need to outplay your opponents. 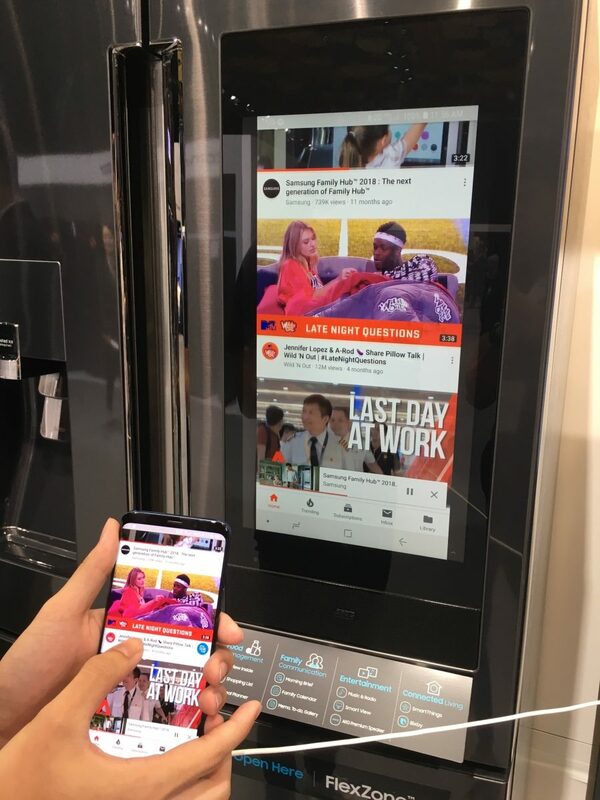 While there are many more innovations from TVs to smartphones to home appliances that Samsung will release later this year, keep your eyes peeled for these three cream of the crop innovations from Samsung in 2019. Get ready for the future.